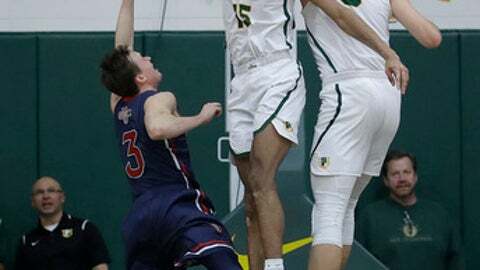 SAN FRANCISCO (AP) Saint Mary’s coach Randy Bennett is convinced of one thing with three games left before the postseason begins: The 15th-ranked Gaels better find a way to score when Jock Landale is on the bench or they’re not going very far. Back-to-back losses drove that point home clearly. Frankie Ferrari made a key 3-pointer as part of a big San Francisco run late in the second half, added a clinching layup with 58.5 seconds remaining and the Dons held on to beat Saint Mary’s 70-63 on Thursday. That hadn’t been a problem for the Gaels until recently. Landale, who leads the West Coast Conference in scoring and rebounding, was held to just four shots and two buckets in a 78-65 loss to Gonzaga on Saturday. Against San Francisco, the Gaels big man had 19 points before fouling out with 1:41 remaining. Landale made six of his first seven shots, but went 0 for 5 in the second half. Ferrari finished with 20 points and seven assists, Jordan Ratinho scored 13 points and Jimbo Lull had 10 points and seven rebounds to help San Francisco (15-13, 7-8 West Coast Conference) to its first win in five games against ranked opponents this season. It was a bitter loss for the Gaels (24-4, 13-2), who dropped their second straight and fell a game behind No. 9 Gonzaga in the WCC. Saint Mary’s back-to-back losses have come on the heels of a 19-game winning streak that was the longest in the nation. It’s the first win by San Francisco coach Kyle Smith in four attempts against his former mentor Bennett. Landale sat out 5 1/2 minutes earlier in the second half after picking up his fourth foul 18 seconds after fellow starter Jordan Ford was whistled for his fourth. The Gaels trailed 48-47 and were still down by one when Landale checked back in with 4:57 remaining. Ferrari had a 17-foot jumper that put the Dons up by three, then made a key 3-pointer after Landale made two free throws to pull the Gaels within 59-58. Landale fouled out moments later. San Francisco ended a seven-game losing streak to its Northern California rivals. The Dons had lost 24 of the previous 25 games between the teams. Saint Mary’s got off to a quick start behind Landale, who become the fifth player in school history to score 1,500 career points with 700 rebounds. He had 15 points in the first 12 minutes. Three of his early buckets came off dunks, including a soaring two-hander down the lane. Saint Mary’s: With three games left the Gaels will need some help if they are going to have a shot at the league championship. Landale’s foul troubles were an issue but his ineffectiveness in the paint in the second half was even more so. San Francisco: The Dons showed a lot of growth the last two weeks, but it was their grit that put them over the top. Coming off a tough overtime loss to BYU, San Francisco never let Saint Mary’s get comfortable down low and took advantage whenever Landale was out. Saint Mary’s dropped four spots in the poll after losing to Gonzaga last week. The fall is likely to be much more severe next week, even if the Gaels win their next game. Saint Mary’s backup center Jordan Hunter had a shot blocked by San Francisco 7-footer Jimbo Lull late in the first half but got redemption in the second half when he came from behind to swat a shot by Lull. Saint Mary’s: Play at Portland on Saturday. San Francisco: Hosts Loyola Marymount on Saturday.